One Cool Tip .com: The Sparkly End of Facebook? Facebook has made a change this week. And not for the better. It is now allowing animated gifs to be added to status updates. The world is ending as we know it. MySpace, the forerunner to Facebook, came to its bitter end due in part to the proliferation of animated gifs and autostart music that were used to decorate profile page. Facebook built its audience on a clean, simple interface and fast performance. 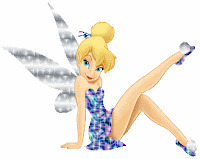 Maybe the world is ready for Sparkly Tink to show her stuff again. If you are interested in living on the wild side, you can add an animated gif by pasting in the URL. Uploaded gifs are not currently supported. The gif must be on an external website. have fun! The feature is still rolling out to users. So you may not yet be able to add an animated gif to your timeline. Also, animated gifs work on the web version of Facebook but not yet the mobile app.